When people talk about fish, they use lots of words you might not have heard before. Below is a list of commonly used words with explanations of what they mean, as well as a picture of a fish showing the names of the different body parts. Ambush: An ambush is where predators hide and use the element of surprise to attack unsuspecting prey. Camouflage: Camouflage is the art of not being seen. Being the same colour as its surroundings makes a fish difficult to see. Patterns can also help disguise outlines. Predators might want to be camouflaged so that they can sneak up on prey. Other fish may want to be camouflaged to hide from predators! Estuary: Estuaries are usually found where rivers meet the sea, creating brackish water – a mixture of fresh water from the river and salty seawater. Flat fish: Flat fish look like they’ve been flattened! These fish usually start off as normal round fish as babies, and quickly start to flatten out as they grow. Most flat fish have both their eyes on one side of their head, with one of the eyes moving around the body as the fish develops. Fish like flounder and sole are flat fish. Juvenile: Any young animal (even a human) is called a juvenile. Life cycle: A life cycle is the series of changes an animal goes through from conception (spawning) to death. Metamorphose: When an animal metamorphoses, it completely changes its appearance. Good examples are caterpillars changing into butterflies, and flounders changing from round fish to flat fish. Migration: Seasonal movement of animals from one region to another. Nursery area: Young fish often need different food and conditions to adults. Nursery areas are places with suitable food for juvenile fish, and also provide shelter to protect them from predation. Plankton: These are tiny animals which float in the water column and provide an easy snack for lots of different types of fish. Prey: An animal which is attacked and killed by a predator. Some animals are both predators and prey. Bass are predators of small fish, hunting and eating them, but bass are eaten themselves by shark species, so bass are the sharks prey. Round fish: This is a normal fish shape. 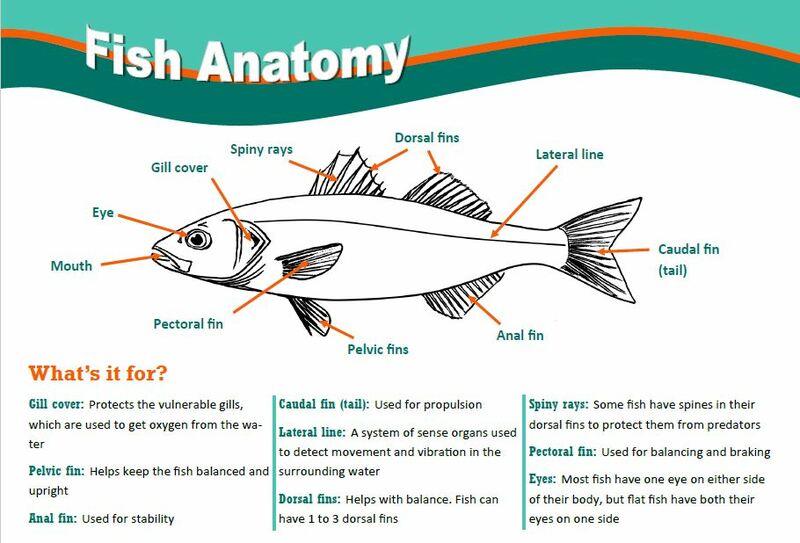 Fish like cod, mullet, bass and herring are round fish. School (of fish): A group (or shoal) of fish which swim together. Shoal: A group of fish which stay together for social reasons. Spawning: Many fish reproduce by releasing eggs and sperm into the water column.